Autumn means changing leaves and fall treats. The autumn season is one of the most beautiful here in the White Mountains with cooler weather and changing leaves. Visiting during this time of year means less crowds and beautiful scenery. We believe everyone deserves the best rate available. That’s why we offer fair and simple every day pricing without sales gimmicks. We offer discounted admission for senior citizens and military service members. Sorry, no other discounts available. Our fall weekends begin on Saturday, September 7, 2019 and continue weekends only through Sunday, October 13, 2019. Our hours are 9:30am to 5pm on these dates. Please note, we are closed on Columbus Day (Monday, October 14, 2019). 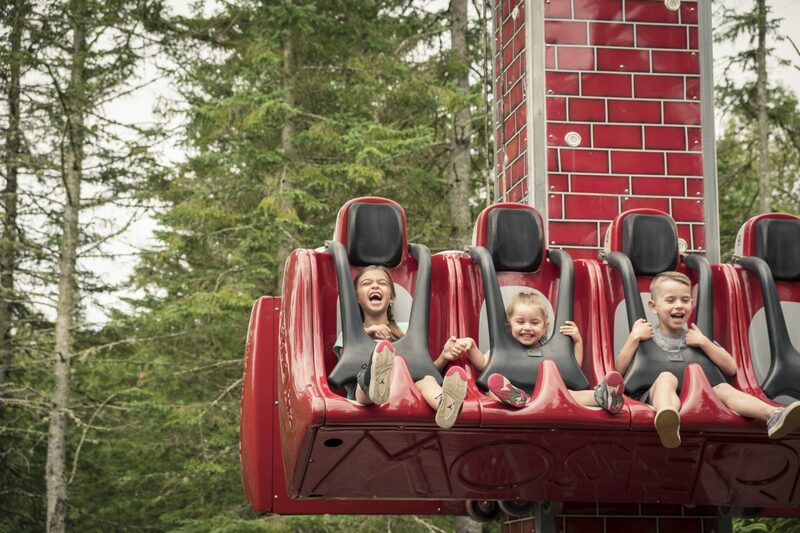 During this season, we anticipate having all of our rides open for your enjoyment. In order to open the water park, air temperatures must reach at least 65 degrees. The minimum temperature is required for the safety of our guests and staff. All of our dining and gift shops will be open as well. Santa and his reindeer will be available to meet. We offer two shows during this time; “A Tinkerdoodle Christmas” and “Santa’s Light Show.” Any closures will be listed at our Ticket Booth day of. We recommend dressing comfortably for a day at an amusement park. Most rides require t-shirt and shoes. We highly recommend bringing layers as temperatures can change throughout the day. Don’t forget your swimsuit in case you’d like to enjoy the water park! You’re welcome to purchase tickets in advance for your visit but it is not required. Tickets are sold until one hour prior to park closing. If you purchase your tickets in advance, you’ll be able to use our Express Lane (offered most mornings) for faster entry to the park.